A tinge of sadness as we entered J‘s comfortable home – this was the last round of Come Dine With Me Dubai, the fifth in a series of extraordinarily enjoyable lunches. J‘s wife was joining us as it was their wedding anniversary. I did feel a bit guilty casting my probing lens into the corners of their sitting room in her presence but I soon got over this when J poured us a glass of Fragolino – an Italian sparkling red which tastes of strawberries. This stopped H and me from discussing a raid on J‘s wardrobe to photograph his large collection of loud shirts (he had a narrow escape I’ll tell you). Proudly, J showed A a portion of tart that he’d made from one of her recipes – this is the ultimate compliment from one foodie to another. J‘s cookbook collection was impressive and my eyes were drawn to the many groaning shelves. 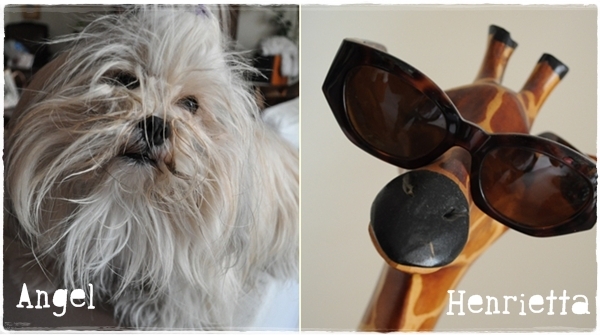 The room was full of ornaments and momentos from an abundance of different travels including Henrietta, the giraffe with shades. The dining room was decorated with Arabic influences – a tiny Royal Mirage. Not sure that there was a caper sauce with the scallops but the sweetness of the cauliflower purée set off the scallops perfectly. I never think that scallops travel that well and usually don’t order them unless freshly caught but these were nicely cooked and we all mopped up the sauce and purée on our plates with some excellent bread. Golden cups arrived and we had to guess what was in them. H was spot on – white tomato soup à la Gary Rhodes. Having sampled it at Taste of Dubai I can honestly say that this was an improvement on the one served by its original creator. The tomato taste was much more intense and sweet and not overly creamy. J had wanted to buy cod but only found hamour (which is also a bit scarce these days) a tasty, local grouper. He reappeared from the kitchen at one point waving a pair of pliers saying “every cook should have a pair of these. Pinbones…”! With scallops and fresh fish on the menu you may be surprised that the beluga lentils were the star of the show for me – dotted with capers and with a tiny amount of foam (the soup again which worked perfectly), they kept their shape but were soft without mushiness. Crunchy potatoes were a great foil – I think the inspiration for this dish was Gordon R.
Thank goodness that S (J‘s wife) shares his interest in food as we had a lo-0-0-ng conversation about the provenance of food, a topic close to our hearts but possibly not that riveting to those not similarly obsessed. Angel, the lhasa apso, hovered at our feet expectantly; the bottle of Oyster Bay Sauvignon Blanc above her on the table didn’t remain there long (and we weren’t sharing). My love of milk puddings is topped by custard-based ones first, with panna cotta a close second so I was delighted that this rose-scented version was on the menu. Ground and pistachio praline accompanied it plus a drizzle of pomegranate molasses. More sweet treats arrived in the form of salted Scottish tablet (J commissioned Toffee Princess to make this flavour specially), raw chocolate with almonds and some new season local cherries. Our coffees and teas came in an assortment of cups with funny phrases. S took the five envelopes containing our scores and went out of the room to count the votes for us (we averaged them in case you are wondering). Let’s just have a little snoop around before the big reveal. The ultimate winner was J.
J said graciously that there was only one winner – all five of us. 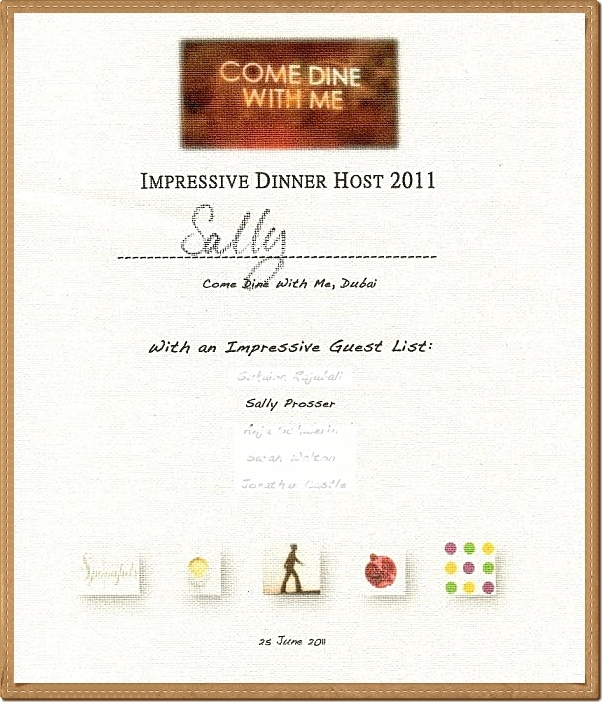 A had made some gorgeous certificates for us all and I was proud to receive an ‘Impressive dinner host 2011‘ award! Saturday lunchtimes had become a much anticipated oasis of good food and company. We all learned so much from each other’s cooking styles, ingredients and approach to the menu as well as getting to know each other better. It was foodie bliss. Looking back on the highlights – I would eat H‘s menu again, in its entirety, any day of the week, S‘s smokey meatballs, A‘s Hollandaise and that fabulous tart and, strange as it may seem to rave about lentils, but J‘s were exceptional. Watch this space – there might be a rematch! And kudos to everyone who took part. As someone who can cook decently enough (wow, so modest ;)) but hates doing it, I am always amazed by the amount of effort people put into presentation, labouring to get it right… because I cannot do it myself (sheer impatience), I appreciate it so much when people do. Ooh the panna cotta looks impressive. Huge applause to all you cooks and winners 🙂 Its been an enjoyable weekly read! Thanks Elaine, Tricia and Dee – believe me the pleasure (and the odd nervous pain…like when I didn’t see the fish wrapper and it ended up in H’s banana leaf parcel!) was all ours. We’re really going to miss these lovely lunches. hey hey, I’ve missed all your great adventures. Congratulations for having the courage to take part in such an interesting initiative! Where can I watch it? Youtube? I’m so proud of you! Ah – we weren’t brave enough for video…this time! Who knows. I was waiting for your write-up the whole day. I must say it’s sad that it is over. I enjoyed every single dinner. Our CDWM lunches became a Saturday institution in no time. J was a deserved winner, I could have licked every single plate and bowl. I think, it’s an honour to be invited to someone else’ s house. You catch a glimpse of intimacy of that person. If you are being made feel comfortable at someone else’s house, that’s something that no money can buy. Thank you all, I had a fantastic time! I can only agree. Have a lovely summer. Thank you Sally, you have a unique gift for making the ever-so familiar seem exotic and beautiful – is that really my house, my food??? And thank you all, H, A, S and S, for inviting me into your homes, your competition, and to your tables. It was an extraordinary privilege, and I am blessed indeed to have had the opportunity to reciprocate. There is no finer compliment a cook can have than the considered opinion of others who know, understand and appreciate good food, and I thank you all. Now, what’s for tea? What an exceptionally lovely comment ‘Masterchef’. Congratulations dear…winning such a competitioin is more reward than any prize I bet. We all felt we were winners as the reward was some very lovely lunches! Really enjoyed reading all your real-life Come Dine With Me adventures! 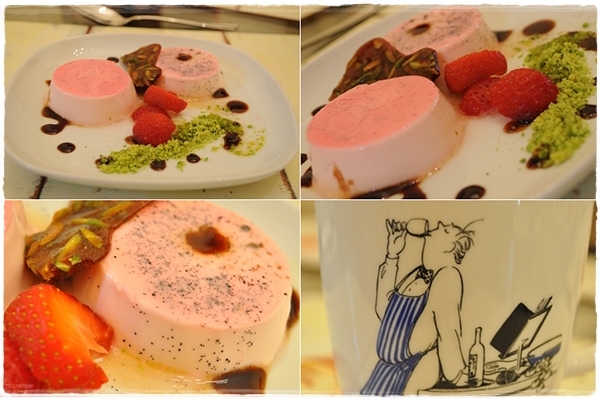 The rose scented panna cotta sounds divine. And I would love that amazing, no-doubt-creaking bookshelf of cookbooks! 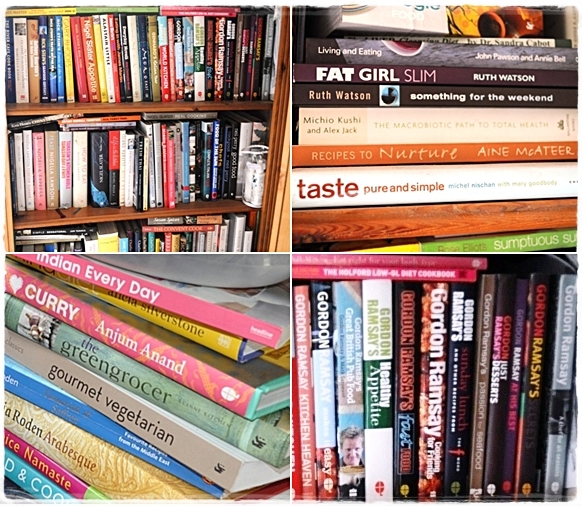 Oh yes – as a bit of a cook book addict myself I had my eye on a few. Wow, I feel a bit sad now it’s over. I hope you have another round. Would have loved to try J’s white tomato soup. I loved the pic of you in the mirror. Congratulations to you all – it has been wonderful to read all 5 instalments. Well spotted – it was deliberate! Have loved reading each post on this – thanks for ‘inviting’ us to be part of a special series on fabulous food and wonderful friendships. I too am sad that it’s all over. I loved reading all your write-ups Sally. How divine? You are all so creative with your menus and cooking. Panna cotta is a big fave of mine too. Oh my goodness that dog looks soooo scruffy! 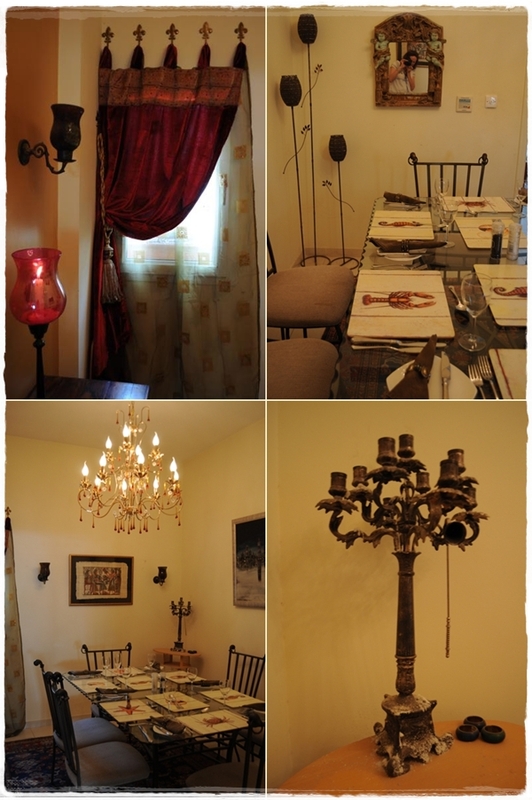 Thank you for taking such lovely pictures of our house and missing out the messy bits (apart from the dog!). I love this show on BBC Lifestyle and have seen them all. It is such a fantastic thing that you all got together to bring it to Dubai. Thank you for blogging about it. I had such a fun time reading about all of them.